Fingers laced together, my hands form a basket – a catchment – through which rain might weave and collect. To offer the basin of a hand freely, its contents extended towards another, is to give a gift. The grace apparent in Tamara Lee-Anne Cardinal’s Mekinawewin, to give a gift is rooted in this circular gesture of exchange. It is an invitation into relationship and an introduction into the deep humility of belonging. Born in Lloydminster, Saskatchewan, Cardinal has resided in Mohkínstsis (Calgary) for seven years. Embodied expressions of territory acknowledgment echo profoundly throughout the artist’s personal conduct and creative practice. Tracing her ancestral heritage back to both the Saddle Lake Cree Nation and the German settler communities of Saskatchewan, Cardinal approached this generative project through a series of process-based workshops and a recent exhibition at the Untitled Art Society with the gentle deference of a guest on Treaty 7. Emerging from time spent in discussion with Elders, Knowledge Holders, and members of the tribal nations of Treaties 6, 7 and 8, as well as members of the Métis Nation of Alberta, Cardinal’s exhibition presents a powerful and incisive view of this land and its histories dating from pre-contact through to the present. To give a gift is the result of several weeks effort shared among community groups sitting in kinship and acknowledgment of the wisdom and grief of generations. 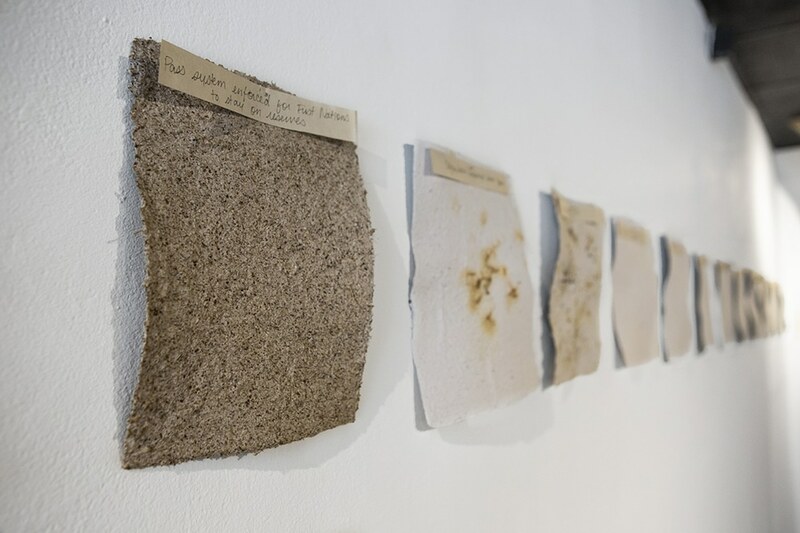 A timeline foregrounding an Indigenous history of Alberta materializes across rough sheets of paper shaped by these many hands – as much a result of stories told aloud as of the mixture of water and botanical pulp. The coherence of paper is fragile; the skill of making it, a gift to be taught. With Mekinawewin, Cardinal’s motivations transcend the conveyance of purely historical or skill-based ways of knowing. A uniquely syncretic blend of papercraft and Indigenous epistemology advances a view of the sovereignty of nations existing in Alberta, having perpetually been excluded from the Eurocentric narratives which dominate it. For many this exhibition presents the gift of seeing something anew. Tamara Lee-Anne Cardinal: Mekinawewin, to give a gift was on display from January 12 to March 23. Jenna Swift is an independent writer and artist based in Calgary. Her past honours include a curatorial research internship at the Smithsonian Center for Folklife and Cultural Heritage in 2011 and the Canadian Art Foundation’s Writing Prize in 2013. She joined an illustrious cadre of peers as part the Critical Art Writing Ensemble during residencies organized by the Banff International Institute of Curatorial Inquiry in 2016 and 2018.